It’s been a while since I posted any recipe as I was pretty busy at the baking n home front. Having taken my baking adventures a step further by moving into offline mode n being part of exhibitions, time for blogging has drastically reduced. Got certain recipes queued up for sharing, so lemme begin with the first one amongst them. Cake pops r definitely one of those fancy looking cuties that have takers, spanning all age groups. At fleas, you could find kids running over to the counter esp. to grab these little pops. 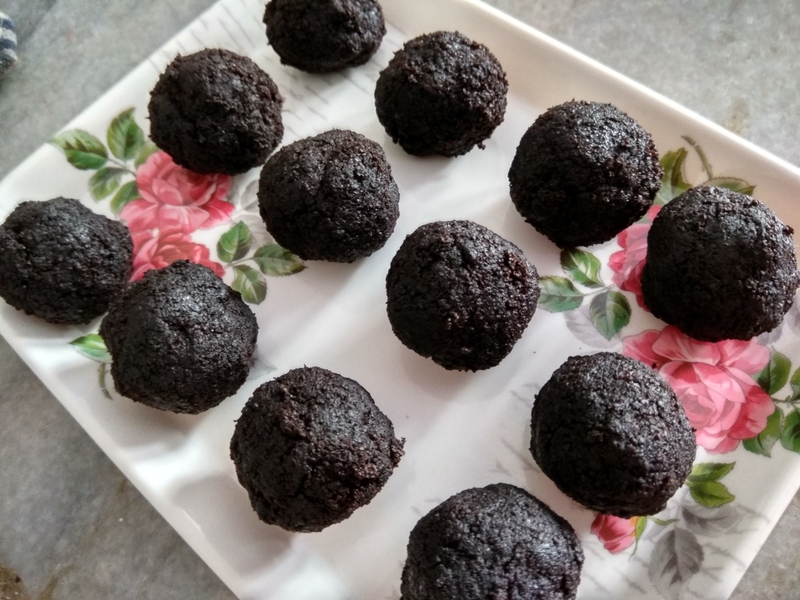 So today it’s the recipe of Cake pops that m sharing which I had done for a fest in recent times. Chocolate frosting – 2 tbsp. 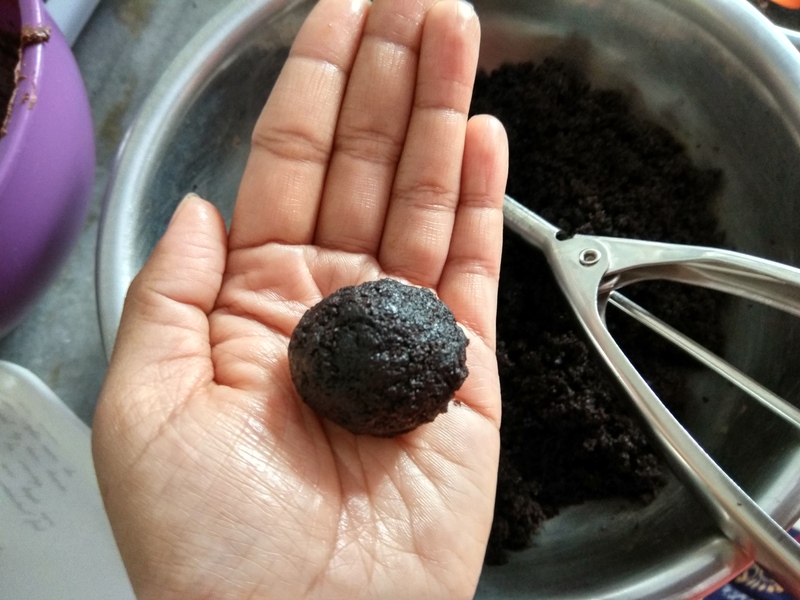 Dark Chocolate – 100 gms. 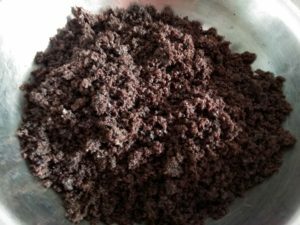 Chocolate sprinkles – 50 gms. 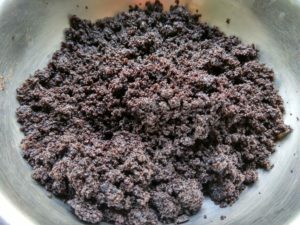 Take a freshly baked chocolate cake and crumble to fine powder. 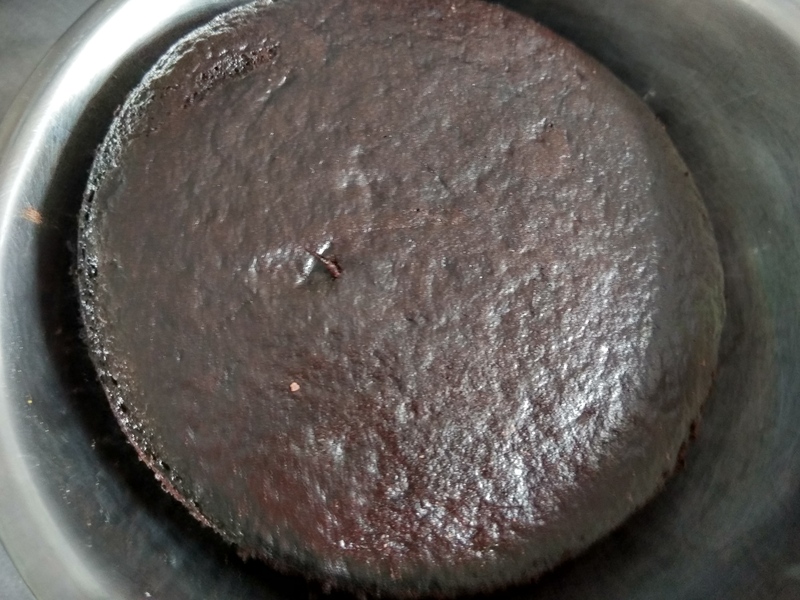 Click here for the recipe of chocolate Sponge cake. 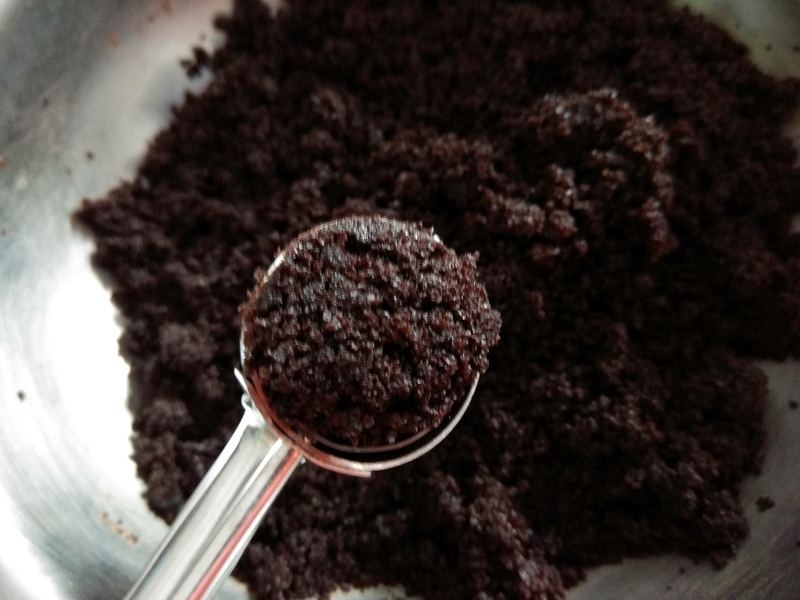 Add frosting and rub with palm till the mix feels slightly wet and starts holding shape. Start with 1 tbsp. frosting n increase as needed. Make equal sized balls and keep aside. Take dark Chocolate in a bowl and melt using double boiler or microwave. Now take lollipop sticks and dip its edge about an inch in the melted chocolate. Next, pierce the balls till the chocolate coated length is covered. Once done, freeze these balls for abt. 30mins. 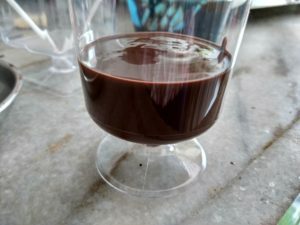 Pour the melted chocolate into a deep mug or bowl. 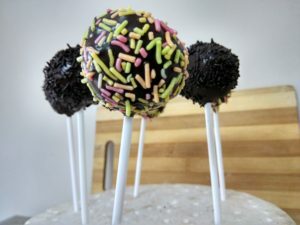 Remove the set cake balls from the freezer and dip into the melted chocolate completely by holding the cake pop sticks. 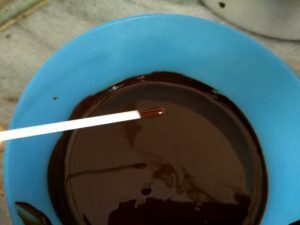 Hold the chocolate coated balls over the melted chocolate till all remaining chocolate drips from the surface. 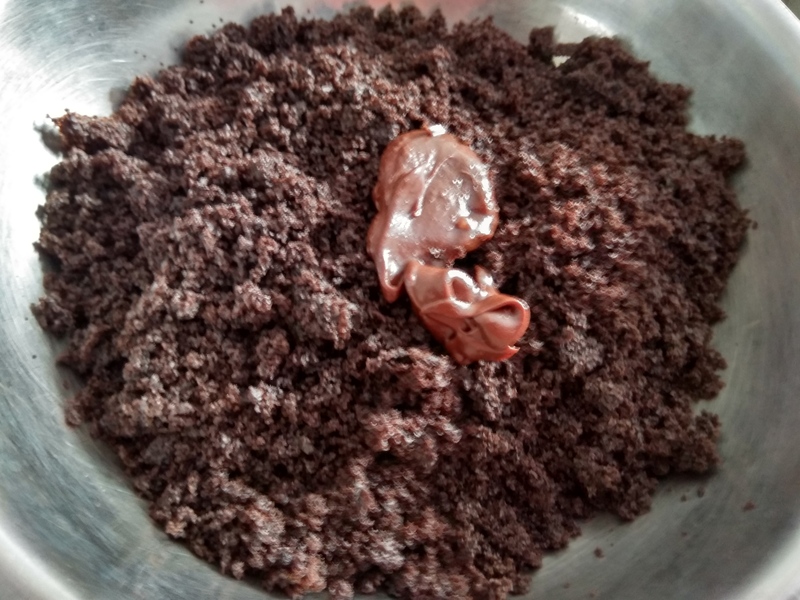 Sprinkle the chocolate sprinkles over the chocolate balls before it dries completely, or else it will not stick on to the balls. 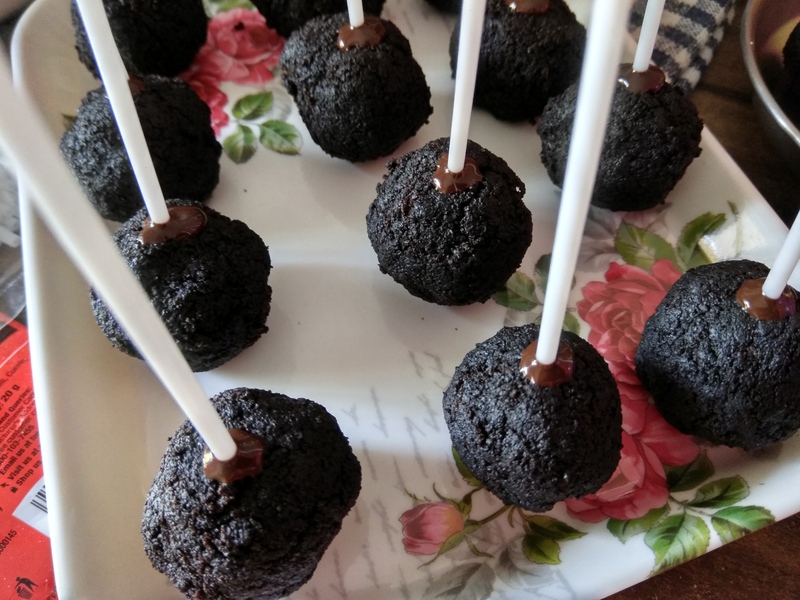 Now pierce the cake pop sticks onto a Styrofoam and let it dry out completely. Store refrigerated, till the time to serve. 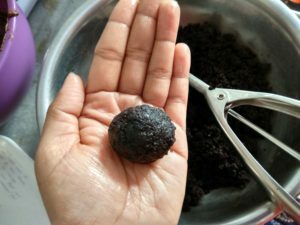 Take dark Chocolate in a bowl and melt using double boiler or microwave. Now take lollipop sticks and dip its edge about an inch in the melted chocolate. 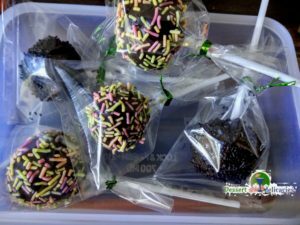 Pierce the balls till the chocolate coated length is covered. Once done, freeze these balls for abt. 30mins. 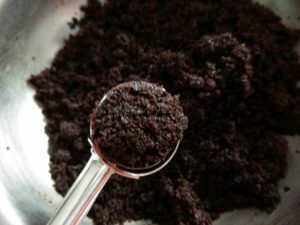 Now pour the melted chocolate into a deep mug or bowl. 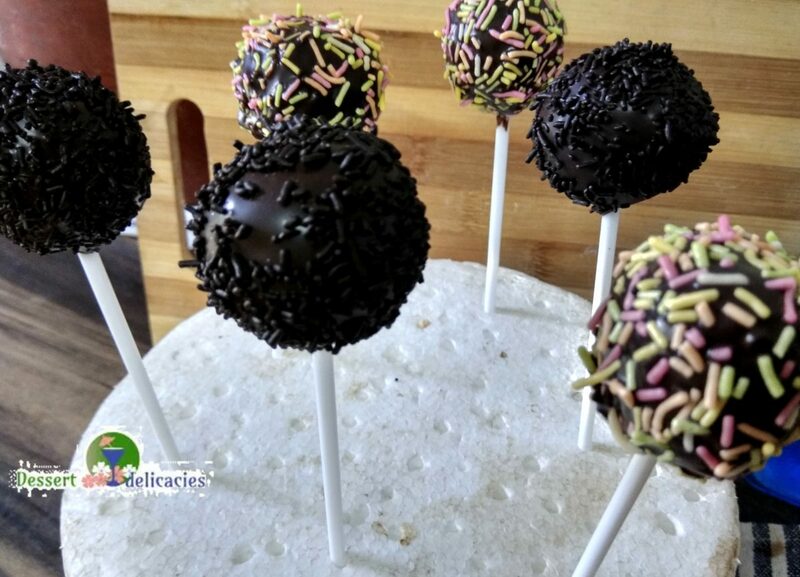 Remove the set cake balls from the freezer and dip into the melted chocolate completely by holding the cake pop sticks. Hold the chocolate coated balls over the melted chocolate and swirl it around till all remaining chocolate drips from the surface. 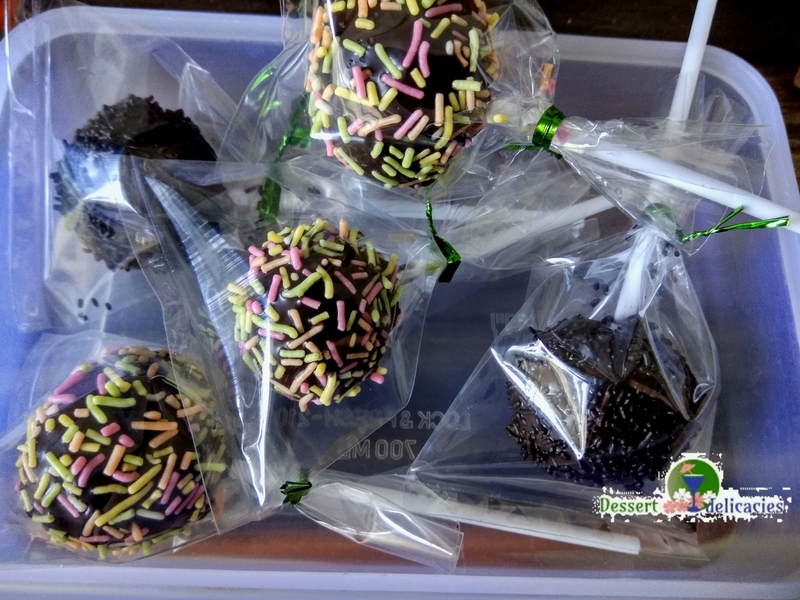 Sprinkle the chocolate sprinkles over the chocolate balls before it dries completely, or else it will not stick on to the balls. Now pierce the cake pop sticks onto a Styrofoam and let it dry out completely. Store refrigerated, till the time to serve.